Gardens | Londons Gardens and Parks Near London. Hidden amongst the bustle of daily London life and nestled between buildings, are many little oases of green – these are the Garden Squares of London. 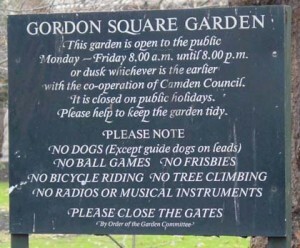 The photo above is the sign of Gordon Square, a favorite for local dog owners and those looking for a little respite from the bustle of local city life. Gordon Square is a quaint garden, one of many of Londons Gardens that are hidden like diamonds in the rough. 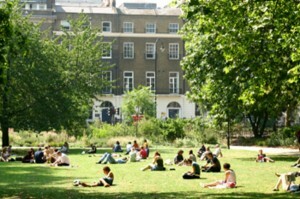 Below is another image from Gordon Square. Londons Gardens are more than just huge gardens that you see in most cities, they are beautiful bits of what the planet used to be before we built our selves upon it. We see patches of hidden squares all over that are most appreciated by those who live next to them. I hope that we continue to see these gardens as sometimes we feel that technological growth and building sky scrapers are more important than actually having nature around us. Maybe one day, we will realize that we need these and other gardens to continue to breathe fresh air. We aim to collect details on as many squares as possible and provide brief information on each as well as their location. Please visit us again to see updates to our Garden Square posts. Londons Gardens are among some of the most beautiful gardens in the world. Depending on how you appreciate gardens and lush greenery, we definitely have what you are looking for. 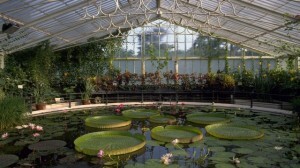 I recently visited the Kew Royal Botanic Gardens and I have to say that I was totally blown away. Now I know that we are all amazed at how luxurious a life gardening makes us feel, but when I stepped on those grounds I immediately knew that this garden is not just babied but literally loved by its gardeners. I have been to many of Londons Gardens and I have to say this is one of the best there is. Sitting next to the Thames River, this garden is huge at about 300 acres and I just adored being there. I didn’t have time to see everything so I focused on the main greenhouse which was way bigger than my own house. I almost wished it were my house once I stepped in. Expansive isn’t even the word for this place and I loved every second in there. I could hardly breathe half the time looking at all of the beautiful plants and the indoor pond. It made me want to go swimming in a second. The huge lily pads looked as though they were all placed on purpose in the exact spot so that they would convey the prettiest site possible. Beyond all of the other attractions that this garden gives you, from the Xstrasa Treetop Walkway to the Princess of Wales conservatory, this was by far the best for me. I had gained so many ideas just from being in the midst of so many wonderful sites and I just wanted to replicate everything for my own garden. I took pictures at every single moment I could. When I finally left I was just astounded at the care this whole entire place needed. I can easily imagine thousands of man hours and as much automation as possible without neglecting the awesomeness of this place. If you ever have the opportunity, you need to come and see this place. And you should also go and see Kensington’s Gardens as well, they are so beautiful. I will also be visiting another garden next week so watch for more since I will be writing on that one too. Most known for it’s planted avenues of ornamental flowers and large, established trees, Kensington Gardens covers 275 acres and is populated by quiet Italian gardens. Main attractions: Albert memorial, Peter Pan statue, Italian gardens, the Serpentine Gallery.